Precipitation Cycle - Welcome to the Paha Sapa Grotto! 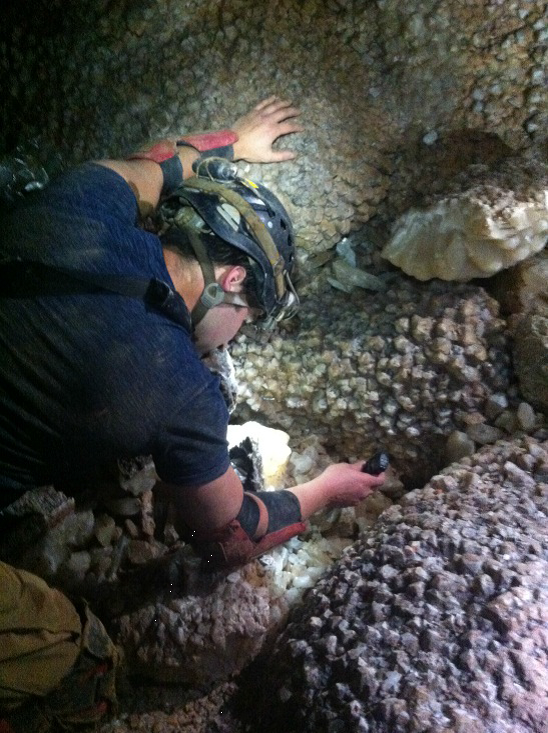 Degassing of the downward moving groundwater is one of the principal triggers for calcite precipitation. The carbon dioxide content of the groundwater that seeps into an open space can be as much as 250 times higher than that of the cavity. When a gas charged solution reaches an open area, the decrease in confining pressure allows the dissolved CO2 to rapidly escape. 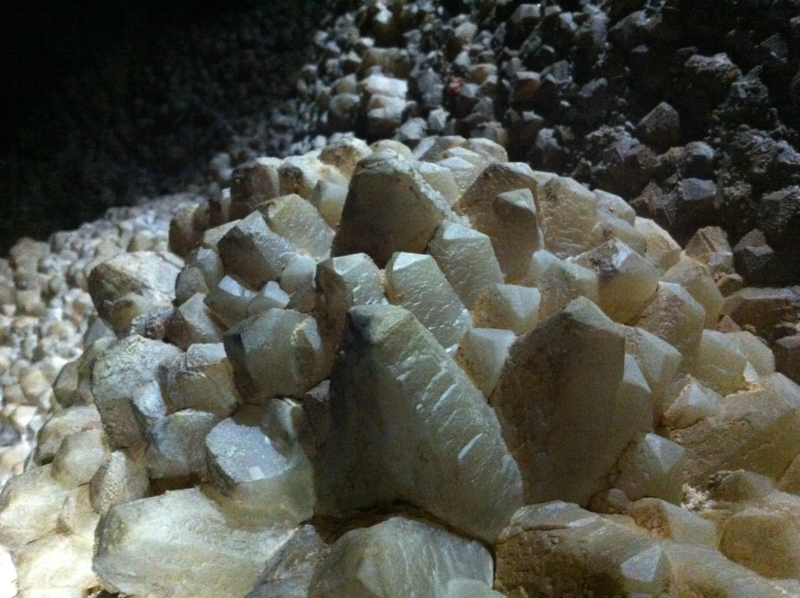 This process results in the precipitation of CaCO3, which is most typically in the form of the mineral calcite. Over time the accumulation of these calcitic precipitates will form dripstone, stalagmites, stalactites and all the other commonly observed carbonate bearing speleothems within available open space. As the partially degassed water continues on towards the water table and beyond, it does not initially carry as much calcite in solution. As a result of degassing, however, the CO2 content of the atmosphere in the cavity rises, which will readily diffuse into any undersaturated aqueous solutions therein and spur additional dissolution. This is particularly true when rock and aqueous solutions within the cavity are at lower temperatures than the incoming solutions. 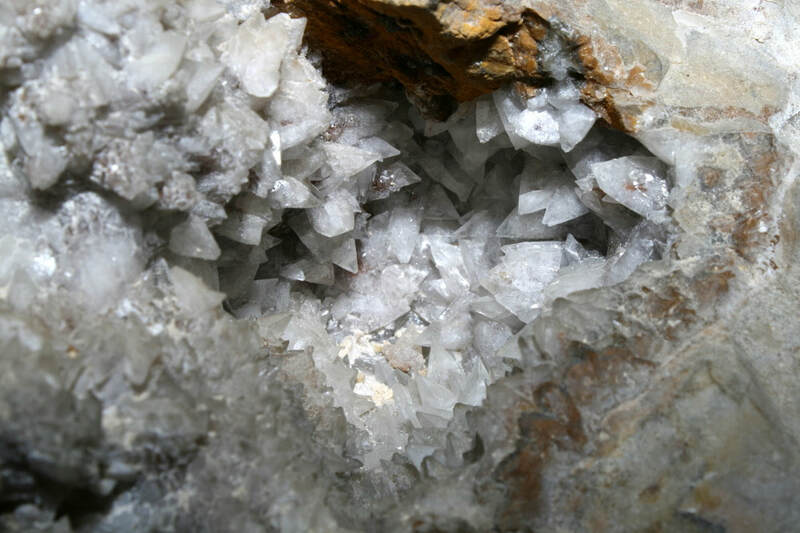 The second major method for calcite deposition is from evaporation of the carbonate saturated groundwater when it encounters open air space. Either way, calcitic formations are deposited that are referred to as speleothems. This term specifically refers to those features formed later than the cavity in which they are found. Although many of the more familiar precipitation features are vadose in origin, major phases of calcite growth occur at or below the water table in the phreatic zone in many systems. In the Black Hills, dog-tooth calcitic spar precipitated at or below the water table is far and away the most abundant mineral produced.